September 29, marks National Coffee Day in a few countries around the world. It's a day where we celebrate our favourite drink, as well as bring awareness to the benefits of fair trade coffee and the struggles that coffee growers go through to produce the beans that sit in your grinder! Hope you all were able to get out to a local cafe today to celebrate. Cheers! The latte in the photo below was taken at Koko Coffee & Design in Amsterdam this summer! Happy Canada Day Everyone! Finally, Saskatoon is experiencing warm weather! If you're at the lake, backyard pool or enjoying the sun somewhere else, we have a solution to keep you cool and caffeinated! BS' in the Kitchen is a young brother and sister team from Saskatoon that shares tasty recipes on their site, with incredible pictures and how-to videos; perfect for young adults recently living on their own. We've wanted to share this BS' In The Kitchen's Cold Brew Coffee recipe and video for quite some time. Now that it's officially summer, check it out and share with your friend! Today marks the one year anniversary of the date we began promoting coffee and coffee culture! It's been a wild year of americanos, lattes, mochas, cortados, French press, pour-overs, chemex, drip coffee and more! Thank-you to everyone for your love and support. We're excited for the continued growth and awareness of the coffee scene in the next year. Celebrate today, and this weekend by enjoying a drink at a locally owned cafe! Birthday latte and a espresso brownie! My office just moved to the suburbs. "Suburb", defined by a coffee addict would be: the most challenging place in a city to find quality coffee. Since the move, my co-workers have proudly been taking turns making pre-ground drip coffee at break time. This office collaboration and team-bonding is actually quite awesome to see! It's times like these that I feel bad being a coffee snob. Because I bring French press coffee with me to the office daily, I didn't think the suburb coffee challenge would be a huge concern. However, when my craving hit this afternoon, the issue escalated exponentially. As luck would have it, I came across a tweet from Hot Racks Bakery this morning, encouraging people to "stop in for some coffee and say hi". That was all the inspiration I required. I decided to use my afternoon break to head out on the sidewalk-less streets, and try this place out. If you happen to find yourself in the 'burbs, I'd recommend checking the place out. If not for the coffee, for the wonderful smelling bread! Hot Rack's seems to be the only place to stop for coffee in Stonebridge. No tenants means no sidewalk cleaning. A big thank you to Ominocity for the very kind article they wrote about us the other week! Ominocity is a Saskatoon based E-zine that supports arts, culture and other great things in the city and province. Give them some love! We are excited to announce the upcoming debut of YXE COFEE MAGAZINE later this month! Whether you are a seasoned writer, or can barely spell your own name, we encourage you to submit coffee inspired articles. Rumour has it, if you submit an article, you will be entered to win a prize! Articles can be submitted to yxecoffeeclub at gmail dot com. Happy writing! Drink coffee. Get inspired. Share it with us! "I read it in The Times"
If you read something in "The Times", it has to be true, right? Well in this case, yes. On December 31, 2012 the New York Times published Better Coffee Depends on Good Grinding. Having recently upgraded to a better grinder myself, I must say I wholeheartedly agree! Thoughts? What do you recommend for an entry level coffee grinder? In a world where a majority of the items we consume are mass produced in huge factories and purchased at big-box stores, one should consider the wonderful opportunities that exist to buy locally produced goods. Similar to the growing popularity of microbreweries, there is also an insurgence of micro (coffee) roasters. This can be attributed to the increasing open mindedness of people wanting to try uniquely tasting products and support local ventures. Both roasters and breweries produce handcrafted quality products in limited quantities. Micro roasted coffee is often prepared in batches of 150 pounds or less, by an expert roastmaster who knows how to get the full flavour out of the beans. While the consumer may be paying more for the small batch, this is outweighed by the superior taste and quality. From a marketing perspective (something else we enjoy about coffee and beer), the most unique thing about micro breweries and roasters is they can quickly and easily tailor their products to local and seasonal demands. One of the best examples of this is the growing selection and popularity of holiday blends. We've seen this before with Detour Coffee, but for first time Saskatoon's Museo Coffee has produced a festive roast. Well done to both! We can't wait to see more unique packaging from you both in the future! Happy Holidays From Everyone At YXE Coffee Club! 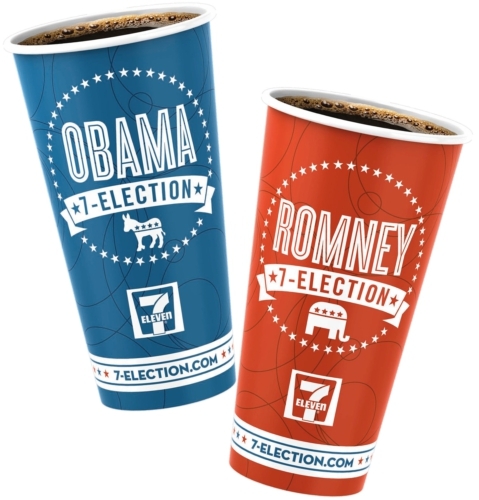 7 Eleven got right in on the US Election yesterday by having Obama and Romney themed coffee cups. As long as they remain neutral, we think this is a cool initiative that cafes should take (any time an election comes up) as a way to encourage and remind people to vote! Share your thoughts here. What got you interested in coffee? Being a typical university student, I like many before, inevitably gave in to caffeine in my second year. I admit, at first I hated the bitter black liquid, and could only handle the high calorie “double-double” (today’s has about 230 cal). This became my daily drink for the next two years. In my fourth year of university, the stars aligned. I realized that one of my friends owned a cafe (Museo Espresso Bar), and I was enrolled in a geography class that focused on urban design, people and pedestrian friendly cities. Our professor argued (and I agree) that some of the “best” urban centers in the world are filled with many small (often outdoor) cafes. The result of all these cafes is the gathering of people; alone or in groups to participate in discussion, collaboration, or simply just to ‘people watch’. It was my love for good urban design, and the hope for a more pedestrian/cyclist/people friendly Saskatoon that sparked my love for coffee culture, and it hasn’t slowed down yet! Join us as we embark on an adventure to educated the people of Saskatoon and the world about coffee culture, with the aim of growing the movement!